As soon as you open your catering company, or, ideally, before, make it your business to hit the ground running by visiting local companies and explaining what you have to offer. Print up business cards (yes, they still have a purpose) and leave them in shops around town. Offer a discount to their customers if they refer you and an even bigger discount if a local shop owner uses your services. For the fullest effect, bring some of your menu offerings with you on these business-oriented social calls so that your new friends will see and taste what you’re capable of making. Everyone loves free food, so your samples will go a long way in making an impression and leaving a lasting, delicious memory. 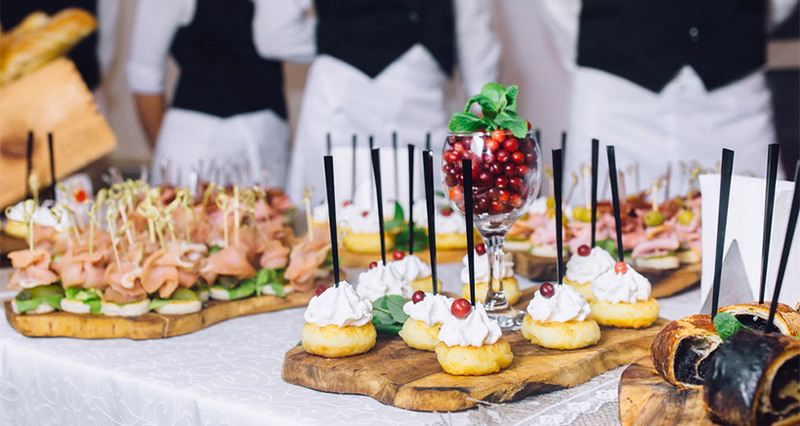 Don’t limit your visits to companies that are related in some way to the wedding or party business; businesspeople of all kinds have the opportunity to use a caterer at some point so in that sense everyone is a target for a visit. Don’t overlook local businesses and law offices, for instance. Hand out your menu, a discount coupon, and an invitation to key personnel to sample your menu. Not only do lawyers have catered business lunches, but they work late hours, necessitating catering at all times of the day and evening. Similarly, advertising agencies and financial firms often have the need for outside catering and their corporate get-togethers can bring in much needed business on a consistent basis. 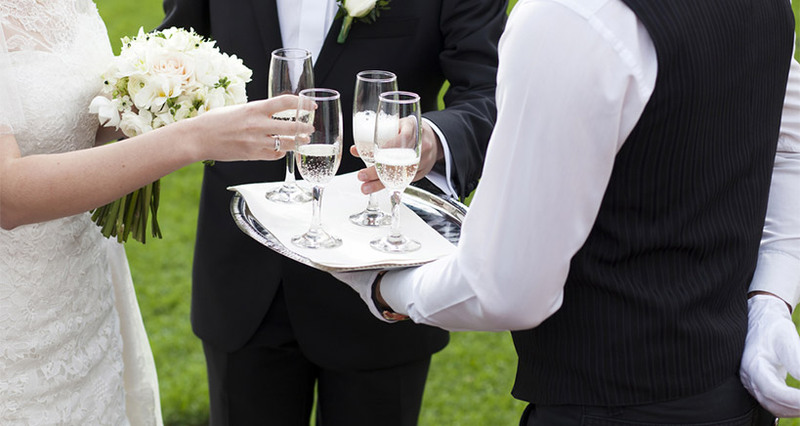 While it’s not uncommon for a catering company to hold tastings for bridal parties, the businesses mentioned above – local firms that have the potential to become steady and valuable customers – will also appreciate well-timed and nicely presented freebies. To reach these potential customers, create a tasting for a number of hand-picked office administrators in the area and go all out to make an impression on these key staff members through your outstanding food and service. 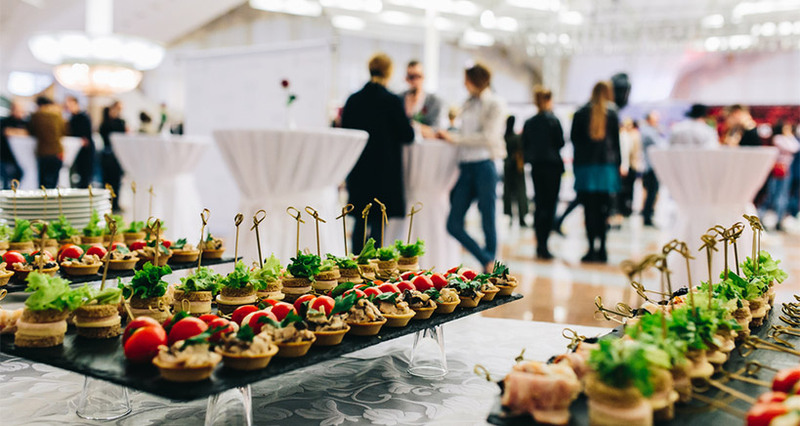 Because caterers can never rest on their laurels, these tastings should be an ongoing part of your marketing program, which can bring in lucrative business from at least some of the attendees. While the tastings mentioned above should be held on an invitation-only basis, after you target specific potential clients, you can also reach out to local businesses by using a less limited open house format to which you can invite many more business and shop owners. This type of setting is a great way for you to highlight your hors d’oeuvre selection and will also show off your ability to function well with a large crowd. This is something of a hit-and-miss process – you may garner only a few clients out a group of a 100 people – yet by systematically wooing local business, you will start to earn a reputation for these types of events, which in turn will spotlight your excellent food and service. Bridal fairs are a great way for you to present yourself, but they are not the only kind of topical exhibitions you should be frequenting. You should also consider fairs for other industries, including legal, medical, financial, media, and public relations firms. These industrial sectors hold frequent conferences, conventions, and meetings, and the event managers tend to invite regional vendors to highlight their services. If you can snag a stand at this type of event, where you can showcase your menu and offer free tastings, it can boost your business exponentially. It’s a way for a large number of potential customers to come to you instead of the other way around. Come to these events armed with plenty of menus and, business cards as well as pricing info alongside your delicious food samples. A stand like this would also work in a local farmers market. Set up a table in a front of a backdrop of photographs plastered with inviting pictures of your buffets and platters. Nothing draws attention like a luscious photo of food and it’s a great way to attract people to your booth. Once they are ogling the pictures, cement their impression with a tasty morsel and a well-timed explanation about who you are. Photographs, conversation, and food are the trifecta of effective marketing – people are not likely to forget you that easily. Registering for a farmers market and attending regularly is also a good way to get to know the other suppliers who show up, so it’s a win-win proposition. Although you may think of a press release as something related to Apple, General Motors, or Microsoft, they’re not the sole domain of Big Business. A small, growing business such as yours can also benefit from this marketing approach and you may be surprised as to the positive effect it will have. Start with a small press release, which you can do yourself. Choose an appropriate media outlet, such as a local paper, a community bulletin, a culinary magazine, or a bridal publication. If even a modest release seems like a big job, you can turn to a company like MarketWired, which specializes in “news distribution and social communication solutions,” or, in other words, a company that can help put you on the map. If you choose to write your own release, make to include your contact information and list the URL for your website and your Facebook page (you can’t make a go of it without either of these). Include information about yourself as well: your background, your personal and professional history, your education, your experience in the food industry, etc. Talk about the ways in which your business stands out from the rest, and include stories, testimonials, and recommendations that will underscore the fact that you’re special. Once again, this is your place to shine, and modesty is not remotely helpful. If you’ve ever done anything newsworthy, this is the time to talk about it and to highlight it in your press release. People read blogs – that’s a fact. So, another way to promote your catering services is to start writing a blog. True, it may not be your field of expertise – like preparing, delivering and arranging awesome food is – but if you can put together quality, interesting content, you can draw many potential customers to your business. The trick to adding content to an ongoing blog is to always have a well of information at your fingertips. For instance, you can always write about your top recipes. It shouldn’t be hard to develop a series of posts that cover the best dishes in your repertoire, including a recipe and photos. Every caterer has a few signature dishes, so write about your special appetizers, your top desserts, or your favorite vegetarian offerings. 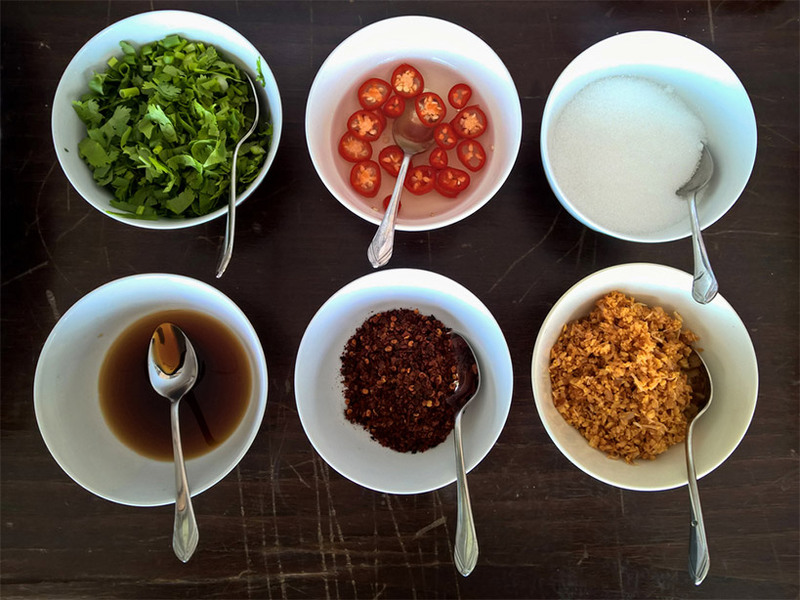 Go into details – readers love nitty-gritty cooking tips – and feel free to wax enthusiastic about the subject matter. Excitement is contagious and readers will pick up on your zeal, attracting them to you and your business. Another wide-ranging topic for blog posts is theme and venue. This goes beyond food to the type of events you have catered and the places where your food has been featured. Along the course of various blog posts you can highlight corporate events you’ve cooked for, weddings you’ve catered, reunions you’ve put together, and holiday parties you’ve managed. These types of blogs will highlight your range and your versatility, so make sure to include pictures of and text about your best events, from buffet lunches to elegant sit-down dinners – and everything in between. You are the face of your catering business and, as you develop a marketing strategy, there is no getting around the fact that you will be front and center. By meeting local business people, attending fairs and exhibitions, and creating a blog that will show off everything you are about and all that you know, you will create a tangible connection between you and your potential clients. This is the best way to grow your business and to fend off the opposition in the competitive world of catering.